The purpose of the Mono Pollinator Garden is to protect and increase the number of wild pollinators. By the example of our garden our GOAL is to reverse the decline of pollinators. Our garden is designed to encourage our community to create pollinator friendly gardens. The problem is a worldwide decrease in the number of pollinators - by at least 50% in the last century. As pollination is necessary for the production of many of our foods the loss of pollinators threatens our food supply. Furthermore, survival of our natural spaces by new growth from seeds is dependent on pollination. Pollination occurs by wind and by pollen transport by insects. Although bees, wasps, flies, moths and butterflies some birds all pollinate, the most effective and important pollinators are wild/native bees. The causes of wild bee decline are habitat loss, pesticides and diseases. Come and See Mono's Pollinator Garden in Action! 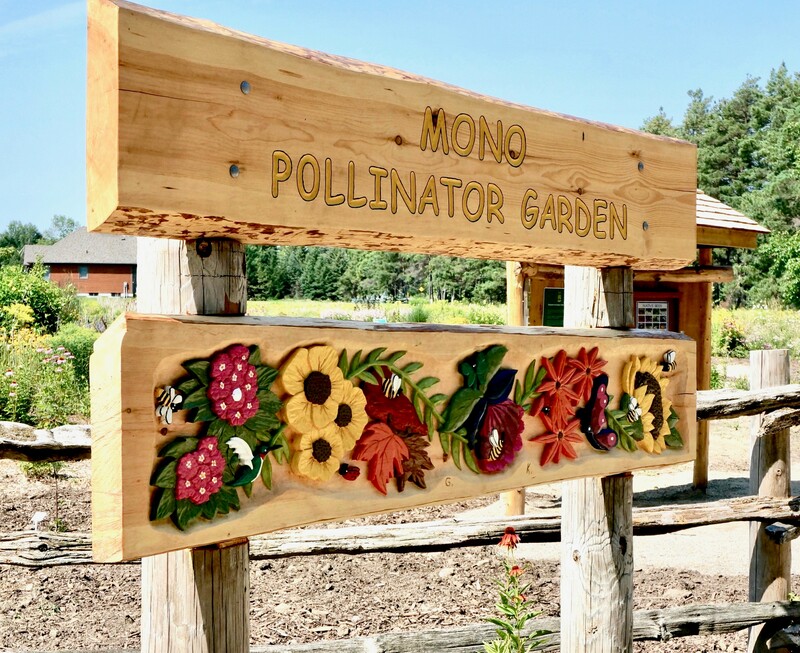 The Pollinator Garden is located on Town of Mono land at 246366 Hockley Road, just west of Hurontario St. beside the Headwaters Tourism and Dufferin Board of Trade offices. The design, construction and maintenance of this garden has been done by local community volunteers. The Garden’s costs are covered by the financial support of the Town of Mono and by donations from interested citizens. Designed to attract all types of pollinators, there are plantings of pollinator friendly perennials, bushes and trees. The plants are selected so that there are blooms to supply nectar and pollen throughout the growing season. In addition to the plantings for bees, moths and butterflies the garden includes pathways, seating and educational signage. What is the MPG's history? Pollination occurs when pollen grains from a flower’s male parts, (the anthers) are moved to the female part (the stigma) of a flower. For fertilization to occur this transfer must occur between plants of the same species. The healthiest seeds are produced when this occurs between different plants. Once on the female part, the pollen grain grows into the ovary and fertilization occurs, producing a seed or fruit. About 75% of the world’s plants and 40% of our crops depend on insects to transfer pollen. Other plants depend on wind and water for pollination. Insect pollinators are attracted by flowers the flowers colour, scent, and sugary nectar. Both the Nectar and pollen are a major food supply for many insects. Transfer of Pollen is often incidental to the collection of nectar. As an insect collects nectar from a flower, it brushes against the flower’s pollen, some of which sticks to the insect’s body. When it moves to the next flower to collect nectar, some of the pollen will break free and be left on the second flower. Sometimes the insect is searching for pollen to carry back to its nest. There are many organisms which transfers pollen from one plant to another including beetles, flies, moths, wasps, birds and butterflies. However our most effective pollinators are wild bees. 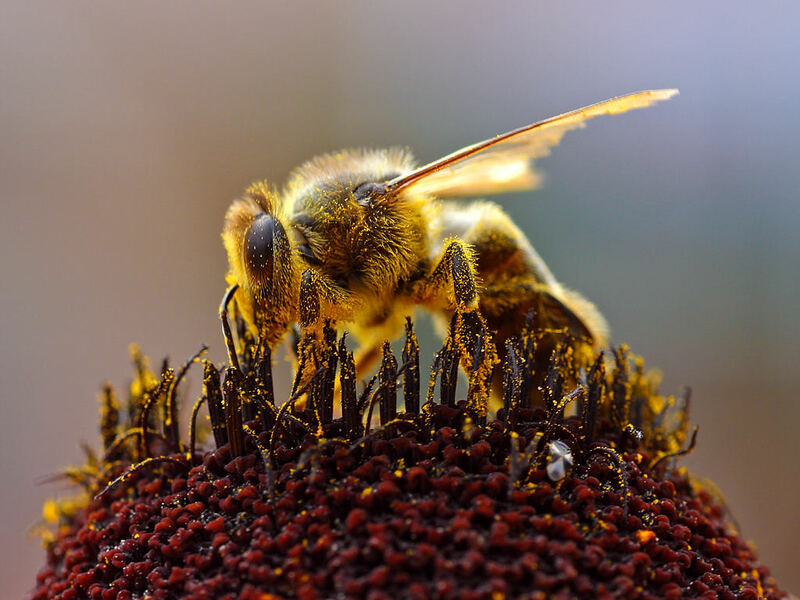 World wide, the number of pollinators has decreased by at least 50% in the last century. The culprits are habitat loss, pesticides and diseases. This is a common problem throughout the world and particularly in Ontario and Dufferin County. We lose land that used to support pollinators by growth and development, and by farming practices that eliminate pollinator-supporting plants. Bees require nectar, pollen, water and a nesting site, and they require this throughout spring, summer and autumn. By providing proper habitat for insects to forage for food, to find shelter and to create nesting sites, we can help the pollinator populations to grow and survive. Your solution to the pollinator problem is to provide these needs by planting a Pollinator-friendly Garden. This type of Garden has trees, shrubs and perennials each of which supply good quantities of nectar and pollen over many weeks. Usually native plants are most useful to insects as their nectar flow and availability is often better than non-natives. By selecting different plants whose blooming periods span the spring, summer and fall seasons, bees are assured of food sources throughout their life span. By involving many of our community in good planting practices in their own gardens the net effect is a very significant for support of pollinators. What Is a Go-to List of Reliable "Pollinator" Plants? We are very interested in new volunteers. Community volunteers who have a passion for gardening and pollinator protection do the work at the garden. Each volunteer sits on one or more committees. Our Maintenance Group works every week on Tuesday and Thursday mornings. These mornings are a good social time, a mix of fun and work. Please come and work with us for half day a week or as much as you are available. What will I get out of volunteering? You will become a better ecologically focused gardener. From some of our experts you will learn choices of plants and habitat and how to help your plants to survive and grow. And most importantly you will be making a difference for the preservation of our ecosystem. 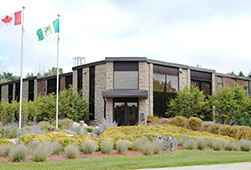 Contact publicworks@townofmono.com and indicate what is your interest, preferably by indicating which working group interests you (see Working Groups & Group Leads). Or you can contact any of our seven working groups directly for information or to join the group. All of the groups have separate functions. We have on site interpretive signage, identification signage and information brochures. Interpretive signage will tell you about the pollination process and suggest perennials shrubs and trees that you might like to grow on your property. We have an educational outreach program that is done in partnership with the local schools. Children are taught and work in our garden. We believe that if children understand the importance of pollinators and their problems that there is real hope for our planet. We also encourage visits by any local group who wishes a garden tour. The management committee for this garden is composed of representatives from the Town of Mono Department of Public Works and the Council of the Town of Mono and the Leads of each Working Group. You or your group may sponsor an event at the Garden. For example, a local bank sponsored a tree planting session for their staff, and a local business sponsored a perennial planting session for their staff. Our Volunteers work with the sponsoring group. These sessions can have an educational component that is led by our staff. 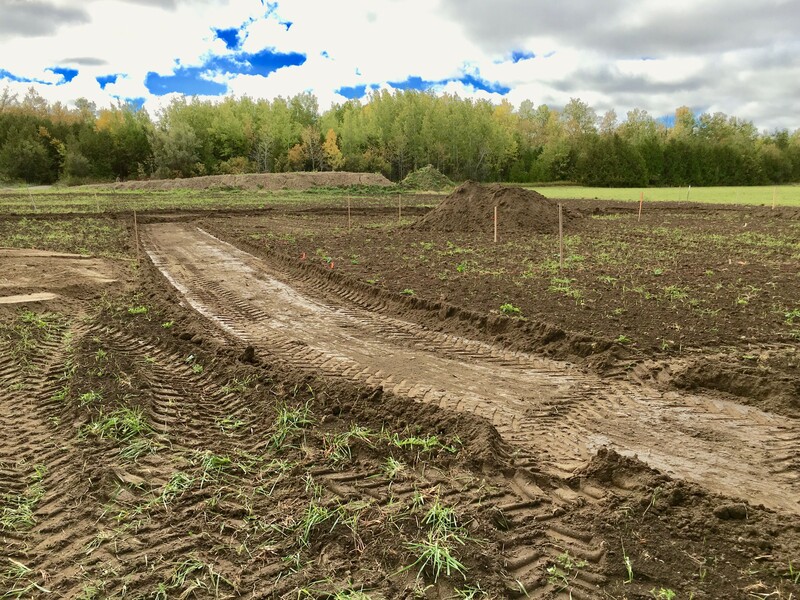 In October 2015, the Council of the Town of Mono approved the concept of the garden, and in 2016, the Council designated the property and donated the start-up funds. Since then the garden was designed, created and maintained by about 25 local volunteers. The initial development was in the north part of the designated 1½ acres of land. As the site was an old hayfield, the spring and summer of this year emphasized weed control by cutting and tilling. An architectural plan was created. The site was laid out with walking trails and raised mounds for growing some plants. Boulders logs and stumps were placed. We developed a management plan and an organization plan for volunteers. This was the first year of planting. We planted on the three mounds and in the hedgerows on the western and northern boundaries. Perennials, shrubs and trees were planted – a total of about 2000. Major construction included a cedar rail fence to demarcate the garden from the entrance laneway, a compost bin and grass swales for drainage. Digging weeds by hand and the use of cedar mulch accomplished maintenance weed control. This became a weekly activity by a group of dedicated weeders. For further weed control the flat areas were repeatedly tilled. In the fall we hosted a group of TD Bank staff that planted over 100 trees in small groves in the south third of the plot. In our second year of planting, we extended into the flat areas and did some in-fill planting on the mounds and the hedgerows. The work of our group of dedicated weeders was extended to two days per week as we worked hard to keep ahead of the weeds. This was assisted by a major cedar bark mulching program. An information kiosk was built, carved garden signage was created at the entrance and we installed a portable toilet. Three custom benches were donated, one of granite and two made of birch slabs. Through a generous donation we were able to create permanent walking trails and a parking area by removing the wood chips and replaced them with fine gravel. We were excited to begin the educational program. This is the prime reason for the garden. We constructed our own messages and graphics for the interpretive signage, made plant name signs and began the visiting educational sessions. The official opening, held on a beautiful Sunday in August was attended by over 100 persons. 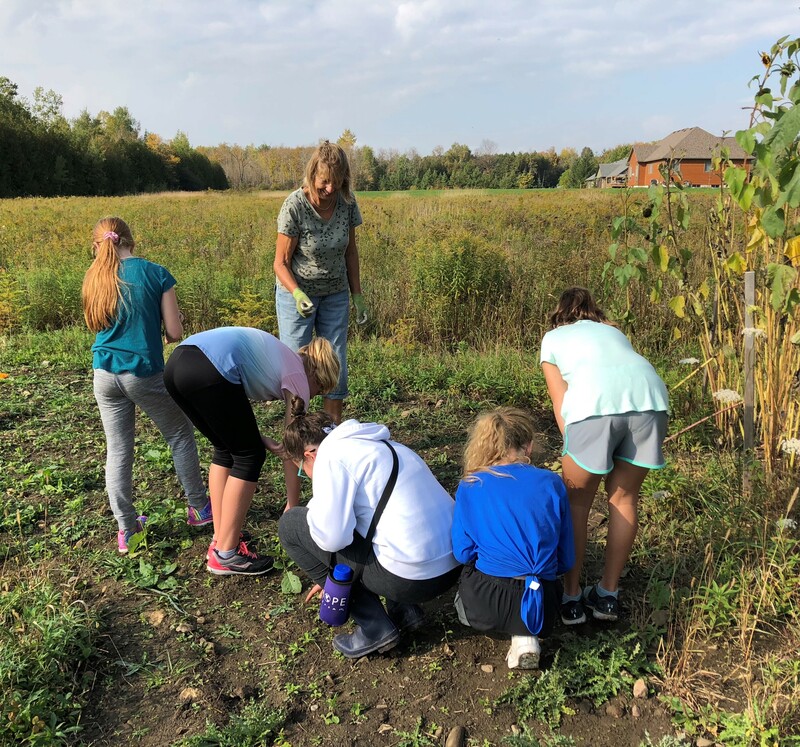 A donation to the Pollinator Garden provides the Garden with the resources that are required to continue its development, its maintenance and its educational programs. You can support the Mono Pollinator Garden by donating today. Fill out the donation form and drop it off or send it to the Town of Mono (347209 Mono Centre Road, Mono, ON L9W 6S3), Attention: Mono Pollinator Garden. Donors may be anonymous or select recognition with or without the appropriate sponsorship. The garden’s donor recognition program is below. 3) recognition plaque in the garden. All donors will receive a tax receipt. We will provide recognition signage.